While we might not think about it often, anyone can get hit with a sudden medical emergency that will result in massive expenses. It can be hard to fully prepare for the toll that these emergencies can take on our finances, often requiring both time spent off work as well as the cost of medical visits, procedures, and prescriptions. Adding to the problem of medical bankruptcies is the fact that many employers have begun raising the share that employees are required to contribute to their health insurance plans. Despite the fact that most Americans are now covered by health insurance, the cost of premiums, deductibles, and copays still add up to more than many can afford. A survey conducted in part by the Harvard School of Public Health found that 26% of respondents have suffered serious negative consequences as the result of medical expenses. Among that quarter of the US population, seven percent have been forced to file for bankruptcy as the result of accruing medical debt they could not pay. As the costs of health care rise, employers have become more likely to pass those costs along to their employees. Between 2005 and 2015, the share of health insurance premiums assigned to employees under employer plans rose by 83%. Additionally, the worker share of individual insurance deductibles rose by an average of 255% between 2006 and 2015. These amounts have vastly outpaced wage growth. Workers are now in a far more precarious situation than when they become ill in previous years. If you’re facing substantial medical expenses, you may have options for reducing those costs. Many hospitals or medical facilities are willing to negotiate the amount of a bill, settling for a lower lump sum on what you owe. Some hospitals offer grants to patients who are in need of financial assistance. Be sure to act quickly to avoid the bill being sent to collections, as this can make it more difficult to negotiate the amount of the bill. If it becomes clear that you will need to file for bankruptcy, you may want to do so only after your medical condition appears to have resolved. That way, once your bankruptcy is complete, you’ll have a chance to get back on your feet without accumulating more medical debt. 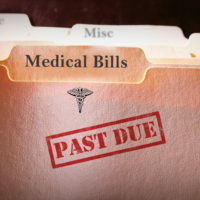 If you’re facing unmanageable medical debt in New York, get help from a law firm that understands your situation, and contact the experienced Hudson Valley bankruptcy attorneys at Rusk, Wadlin, Heppner & Martuscello, LLP for a consultation, in Kingston at 845-331-4100, or in Marlboro at 845-236-4411.